A229’s project plays with the extension to alter the organization of the complex. The proposed option is simple and responds to the existing structures. 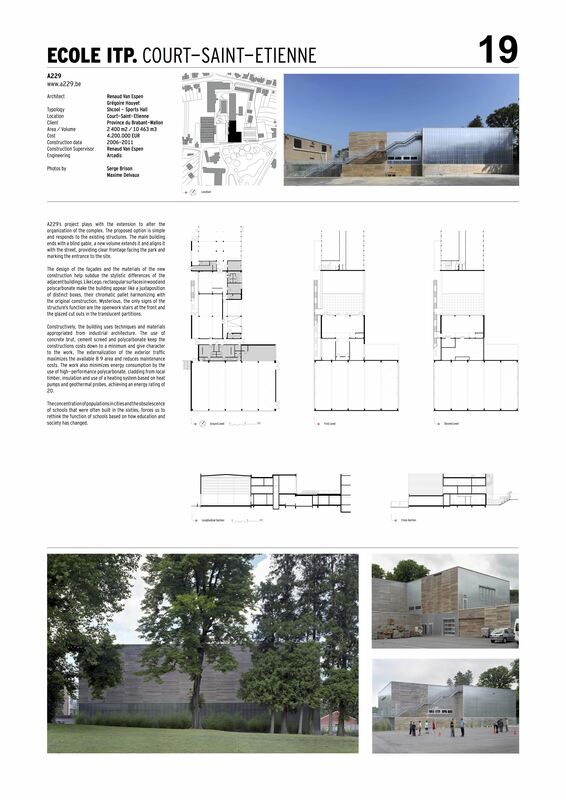 The main building ends with a blind gable, a new volume extends it and aligns it with the street, providing clear frontage facing the park and marking the entrance to the site. The design of the façades and the materials of the new construction help subdue the stylistic differences of the adjacent buildings. Like Lego, rectangular surfaces in wood and polycarbonate make the building appear like a juxtaposition of distinct boxes, their chromatic pallet harmonizing with the original construction. Mysterious, the only signs of the structure’s function are the openwork stairs at the front and the glazed cut outs in the translucent partitions. Constructively, the building uses techniques and materials appropriated from industrial architecture. The use of concrete brut, cement screed and polycarbonate keep the constructions costs down to a minimum and give character to the work. The externalization of the exterior traffic maximizes the available 8 9 area and reduces maintenance costs. The work also minimizes energy consumption by the use of high-performance polycarbonate, cladding from local timber, insulation and use of a heating system based on heat pumps and geothermal probes, achieving an energy rating of 20. The concentration of populations in cities and the obsolescence of schools that were often built in the sixties, forces us to rethink the function of schools based on how education and society has changed.